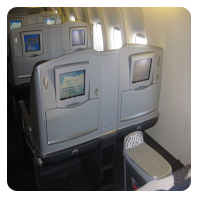 The facilities of flying in Business Class Cabin depend upon which airline you choose to fly in. Make certain you ask in prior about the amenities provided, so that you can select the airline according to what you are getting. Business class passengers have separate check-in area and they can use a business class lounge which provide drinks, nibbles, newspapers and even internet access, Showers, working and resting areas. 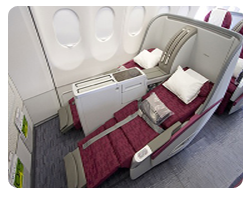 The passengers travelling in Business class Cabin always have the preference to board first. 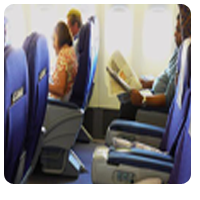 Their seats are larger, offer more leg room, more comfortable, and recline back more than coach seats. Seat pitch is of good measure. There are different types of reclining seats like flat bed seat which reclines to 180 degrees then lie-flat seat which reclines to 170 degrees. One travelling in business class can expect great entertainment options. They provide the following on request: audio and video, portable DVD, Internet access and power sockets for laptops. They even provide with personal screens. If you are travelling with an infant, a bassinet will be provided for your support. Separate boarding areas are provided for Business class passengers and entrée to a business class lounge. Most lounges offer a quiet and comfortable area, drinks, newspapers, snacks, Internet access and even showers. Special treatment is provided to the business class passengers. Better meal is provided to Business class passengers inclusive of snacks and beverage service than coach. In business class flights- whatever you ask for, and you shall receive. You can provide with your own menu and choices. 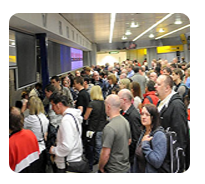 Some airlines will give you an option to pre order before you fly so that they can board what you want. Passengers travelling in Business Class Flights with no doubt get more attention than a Passenger travelling in a normal coach. He achieves all the required facilities. Business class passengers get whatever they want from meals to entertainment. You can relax with extra leg room which is not possessed by normal coach passengers.